This is my third post in a series looking at how federated identity has becoming a reality (I first looked at Twitter, and then Google). I kind of liked Facebook in the early days that I used it, but frankly I never expected it to last. I thought that like the social networks before it (MySpace anyone) it would bud, flower and die. In my view we’re now way past the point when it should have died, but the alternative just hasn’t appeared on the scene. For me the madness peaked with FarmVille, and since then I’ve repeatedly considered FaceBook suicide; especially as each new abuse of privacy has materialised. So… I’m not a fan, but still a (grudging) user of the ecosystem. Consider me a hostile witness. Much like Google an Twitter the initial contact with the user is a sign in with Facebook button. Assuming that they’re already signed into Facebook in another tab on their browser this should get them straight in. So some app that I’ve never used before wants to access a whole bunch of my data (at any time), and post as me, just so that I don’t have to remember another password. Not a fair trade. I’ve written about similar issues with the Google Apps Marketplace, but there’s a desperate need here for finer grained control. You can review the apps using your Facebook ID by going to Account > Application Settings. 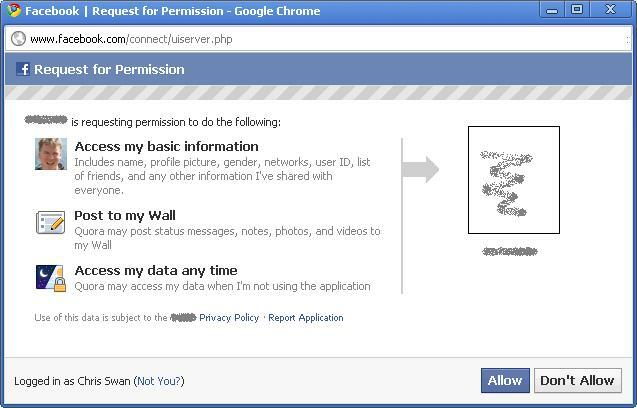 The original Facebook Connect has become deprecated in favour of OAuth, but developers still need to interact with the proprietary Graph API rather than something more open/standard such as OpenID. This recent Hacker News thread explores the pros and cons of this in some detail. People are only supposed to have one Facebook account, and I’ve heard the Facebook team talk through the processes that they use to seek and destroy alternate personae. So Facebook doesn’t just not support persona – it actively discourages it. There’s no strong authentication either. I’m not a fan, but I can see how people can get sucked into using it. It’s good in terms of not having to remember another set of credentials, but it’s bad in terms of all the (potentially) bad things that Facebook and its partners are doing with personal data. Hopefully it doesn’t discredit the whole concept of federated ID for consumers. I mostly consume Facebook via Tweetdeck these days, and I must say that I find it very annoying to have to sign into Facebook just to read links that my friends have posted as I typically don’t have a Facebook tab open in Chrome. I was particularly amused by the suggestion that users might be obliged to pay a cash fee to register if they weren’t engaging in the ‘social contract’ implied by using Facebook. It seems to be popular, but still behind Google – Google Winning Sign-In War, But Facebook Close Behind.